For most of my existence I’ve had to deal with a condition called asthma of the skin (also known as atopic dermatitis or eczema). After many years the most manageable solution that doctors could offer me was a skincare regimen that consisted of quick baths, lots of mild unscented lotions and all kinds of hydrocortizone creams and anti-itch medicines known to man. Thankfully I outgrew it in 2003; that is, up until these last two pregnant winters. With Sam, I was itchy all over my belly. My doctors said that I really just had to live through it, and so to cope I used everything topical available to me. It got so bad I would even use half a bottle of the Banana Boat Aloe Vera Sun Burn Relief Gel a day. At least it smelled good. The allergy did go away after I gave birth… but I will not lie; the three weeks that I had to endure it were sheer torture. We fast forward to this pregnancy, this winter, where the irritatingly itchy splotches and the dry skin all re-appear at about the same time the weather turns. Only now it’s not just on the belly; it’s on my upper shoulder blades, on my back, and on my thighs too! I am scratching like crazy and applying hydrocortizone creams by the gallon. Still, the same advice was given to me: grit and bear it and soon it will go away. “Soon” is relative as you know, as I still have 9 weeks left, instead of three. My thought bubble: horror horror HORROR! I love my shower filter. I am a believer. Thankfully (I do say this a lot don’t I?) one of the gifts we received from my OC Mommy-friend was an Aquasana shower filter. I’ve read about Aquasana and the health benefits of filters and how it can help asthma-related conditions. In addition to that, there are studies as well on their website with evidence that the filter removes synthetic chemicals in the water to make it cleaner and healthier. You’d think it was clean to begin with right? Apparently not! Anyway, so we install the filter and I use it. I kid you not, but after only 3 days I stopped using the creams already. There were still splotches visible at the time, but they were not bothersome anymore. After about a week, my skin was splotch-free. No itch, no irritation, and it doesn’t get that dry as often. We’ve been using the shower filter for over a month now and my allergies have not returned (HURRAY!). In fact, because I noticed Sam and I scratch at the same time on the same body parts, I’ve made a conscious effort to make sure she showers using the filter too, as a preventive measure. There’s so little that we actually know about our water, and how we think it is clean enough to drink or bathe in. Particularly for new moms with young kids or expectant mommies, I really believe these kinds of filters will do our families good. It’s worth the investment if it means less medication and less trips to the doctor. Wouldn’t you want that kind of relief, or peace of mind? I know I would! 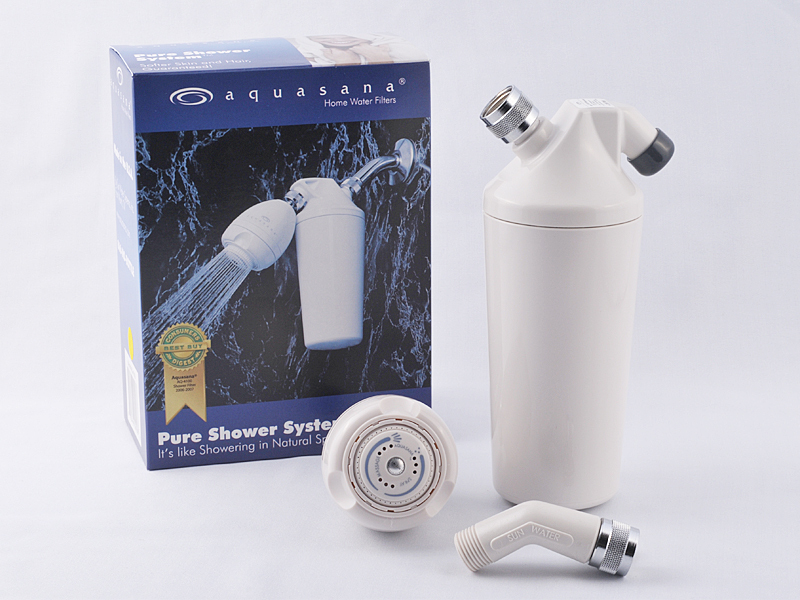 Visit the Aquasana Philippines online store to learn more about water filtration. For my Manila mommy friends, you can get a 10% rebate on your cash purchases after delivery. Don’t forget to enter mymommyology as your referral code. For my US-based mommy friends, visit the store Aquasana Philippines online store and look for the banner above. Click on it to get 20% discount on your Aquasana purchases. My friend’s baby boy also has atopic dermatitis and the doctor recommended she use mineral water for bathing her baby boy. He has major red splotches all over and keeps scratching them. After using the filter, his splotches are gone. Only a few remain by his ankles. It’s testimonials like this that really make the trouble of bringing in this product all the more worth it =) I’m glad it really helped. Who knew bathing water make a major difference?? AH, Error: Who knew bathing water makeS a major difference?? I know! Sarap talaga ng filter! Thank you for introducing it to us! Now I can’t live without it, haha. Yes get a filter na! It will help both you, the new baby and patrick! May pa 🙂 Will look for sponsor first for the filter, hahaha! Thanks Tala! Well now you know if ever you do need a shower filter… there’s a way to get it to Colombo!